Many families save up for months, if not years, for a cruise vacation--a unique experience that combines land and sea. Cruises are supposed to be a time of relaxation, fun and exploration, but sometimes that does not happen. Occasionally, something out of the ordinary occurs and can leave vacationers and their families traumatized by a ship accident and end up needing a cruise ship accident attorney. Unfortunately, this is exactly what happened recently when two gunmen targeted tourists in Tunis, Tunisia. The attackers killed 23 people, including 17 who were on a cruise ship excursion to the National Bardo Museum, where the attacks took place. The two cruise ships involved, the Costa Crociere’s Fascinosa and MSC Cruises’ Splendida, both had passengers visiting the museum when terrorists stormed it. Splendida lost 12 of its passengers in the attack that day, and dozens of other passengers from both cruise ships were also injured in the violence. News accounts reported that two gun-wielding terrorists bursted from a vehicle and attacked tourists as they climbed out of tour buses. The terrorists then charged into the museum and took several hostages before security forces returned fire, killing the gunmen. Words can’t express the sheer terror and extreme grief this event has brought to the victims’ families. If you or a loved one was affected by this attack, it’s important that you know you’re not helpless. Passengers injured during cruise ship excursions may be able to hold the cruise line liable. There are both national and international laws that govern injury and death claims that happen overseas. These laws can be very tough to navigate, so it’s imperative that you seek an experienced maritime lawyer that can help you with your claim. Be sure not to wait because the statutes of limitations for injury and death claims at sea are typically shorter than those on land and your rights can be lost if action is not taken in a timely manner. Our Miami cruise ship accident attorneys will not only help you file a claim, but we’ll also be with you every step of the way. Our experienced attorneys have handled cases that include cruise ship accidents, crew injury claims, and other cruise ship injuries and wrongful deaths. We understand that every case is different and circumstances vary greatly, but we take each individual case and assess it separately to determine a fair settlement. If a settlement cannot be reached, we won’t hesitate to bring your case to trial and to fight for everything you deserve. Cases like these are never easy, and no one should have to “go at it alone.” It’s crucial that you understand your legal rights in a stressful situation such as this. 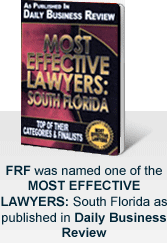 At Friedman, Rodman and Frank, we are licensed to practice law in Florida as well as in federal courts. We have countless years of experience in dealing with cases involving cruise ship accidents, personal injury claims, and wrongful deaths. When filing a claim against a cruise line, our main goal is to safeguard your rights and maximize the value of your total compensation to ensure you and your family receive what you deserve. Compensation for injuries or death overseas can amount to loss of wages (including potential earning capacity), pain and suffering, mental anguish, medical and other health expenses (including past and future). Anyone affected by tragic acts of violence should contact us immediately at 305-448-8585 or toll-free at 877-448-8585. Don’t put off filing a claim. Schedule a free initial consultation with our highly experienced Miami cruise ship accident attorneys. We are available 24 hours a day, seven days a week to serve you.